The Case of Guiteau, Assassin of the President of the United States. The Boston Medical and Surgical Journal. Shattuck, George B., M.D., ed. & Post, Abner, M.D., asst. ed. Boston: Houghton, Mifflin and Company, 1882.
volume CVI., no. 7., pp. 145-153, ill.
4 albertype cameo portraits on one sheet of heavy stock, not paginated. From photographs taken by C. M. Bell, Washington D.C. July 4, 1881. Copyright, 1882, by C. M. Bell. 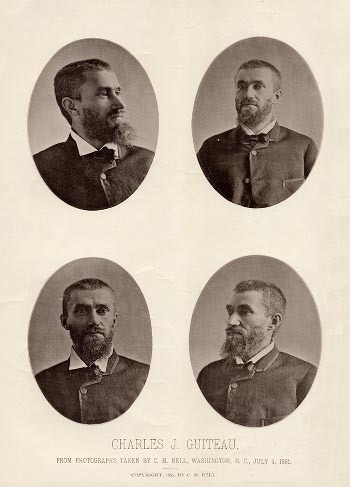 This could very well be the first example of a mug shot appearing in a publication with shots taken of Guiteau's head facing left, right, forward, and a three quarter view advantaging the left side where he had suffered a serious childhood injury to the frontal bone. Copies of these images would have been provided as photographic evidence in the murder trial along with a set of albumens Bell made of Garfield's lumbar vertebrae and which show the damage caused by the assassin's bullet. A set of the vertebral injury photos can be found at the Magrath Library of Legal Medicine, Harvard Medical School. As one of the examining physicians, Folsom found no physical evidence of a degenerative brain disease and he remarks that the assymetrical features as shown in the photographs are "...of some slight value as corroborative evidence of insanity." Still, the intense focus of the eyes are made odd by a skewed axis in the left orbit, and it is easy to imagine a physiognomy of the criminally insane in the face of Guiteau. Folsom's article presents a measured recounting of the misteps that brought Guiteau from a harsh childhood to his years as a failed pamphleteer, newspaperman, and itinerant evangelist and finally to the time of his obsession with Garfield's campaign and succession to the presidency. Although Folsom believed his subject was clearly insane, he was troubled by the absence of a symptomology, finding only a faint suggestion of the paresis and tremors that might indicate a mental disorder. The subsequent autopsy however did reveal in Guiteau a syphilitic infection of the brain. This case represents one of the earlist and most important for the use of the insanity defense.